The U.S. President is the most powerful person on the entire planet. The President is America's Chief Executive and as such he enforces laws, treaties, and court rulings; develops federal policies;prepares the national budget; and appoints federal officials. He also approves or vetoes acts of Congress and grants pardons. The President is also the Commander-in-Chief of the world's greatest military power, where he has the authority to send troops into combat and is the only person authorized to use nuclear weapons. Of the 45 men who have served as President, these 12 are considered by most historians to be the greatest: George Washington, Thomas Jefferson, Andrew Jackson, Abraham Lincoln, Theodore Roosevelt, Woodrow Wilson, Franklin D. Roosevelt, Harry S. Truman, Dwight D. Eisenhower, John F. Kennedy, Lyndon B. Johnson, Ronald Reagan. 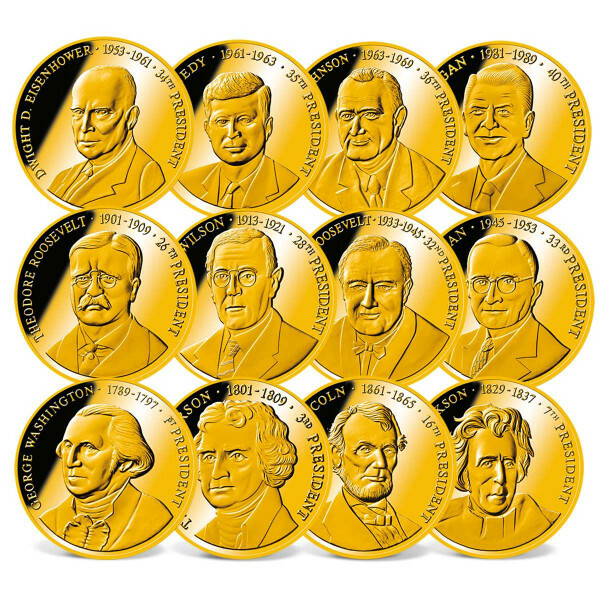 American Mint pays tribute to these great leaders with a beautifully boxed set of 12 exclusive, 24k gold-layered coins. Available for the first time as a complete set, this compilation makes it possible to own the entire series without the wait of monthly shipments and at an incredible savings!